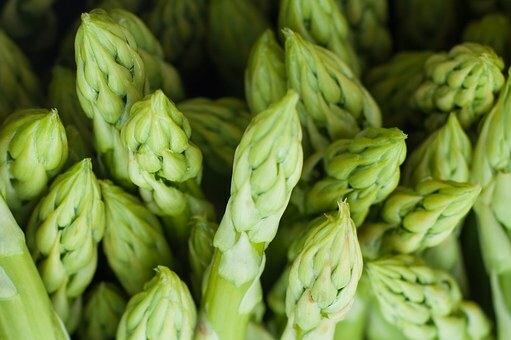 Blog 'Tis the Season for Asparagus: Indulge! ‘Tis the Season for Asparagus: Indulge! Asparagus sprouts up early in spring. Ignore the unique scent it imbues to urine; it’s just that digestion releases asparagusic acid which metabolizes into sulfur-containing compounds. Take advantage of this delicious and rich prebiotic source to feed your healthy microbes. Asparagus delivers 5% fiber by weight as well as four grams of protein in eight stalks. It also offers plenty of potassium, folate, and other B vitamins. Like other vegetables, asparagus can be easily fermented in jars on your countertop. Voila: probiotics and prebiotics in a savory low-calorie treat. After cutting off the off the toughest lower parts, lay in a sauté pan with a half inch of water. Cover and steam on high for about 2-3 minutes. Pour off the water then add a tablespoon of olive oil to the pan. With heat still on high, add minced garlic to taste. Squirt with lemon juice and enjoy. Steam asparagus until soft. Add to blender with yogurt and vegetable broth. Blend until smooth. Serve soup with lemon and crusty whole-wheat bread. Drizzle raw asparagus with olive oil and hot peppers. Roast at 400 degrees until crisp. Blend raw asparagus into smoothie with apple juice and lemon juice. Shave raw asparagus thinly for a salad. Serve with a balsamic vinaigrette and grated cheese. And if you want something truly impressive, try this asparagus soufflé. While not difficult to execute, prep can take some time.